While some motorcyclists like to show off by zooming around town, weaving in and out of traffic, and speeding past cars, most bikers are respectful of the rules of the road. An experienced biker will often remind a newcomer that it’s okay to take your time to get comfortable handling your motorcycle, and it’s important to not do anything on the bike that makes you uncomfortable. Ways to stay in your comfort zone on the bike can include things like finding alternate routes to avoid winding roads or single-lane highways, riding the speed limit, and taking frequent breaks on long trips to avoid fatigue. Getting into an uncomfortable situation can be stressful enough. Considering the fact that you might be going 70mph down the interstate while straddling a 500-pound bicycle to the mix – it can be easy to freeze up or lose control. Staying comfortable and confident is key to making it to your destination safely. It is important to always remain calm while on your bike. This includes avoiding road rage. If a motorist is tailgating or break-checking you, it is better to remove yourself from the situation, than to try and retaliate and cause a potentially fatal accident. If you feel like a motorist is specifically trying to cause injury to you while on your motorcycle, find a safe way to contact your local authorities. Driving while exhausted, intoxicated, or distracted can cause even the most experienced motorcyclist to have an accident. Do not operate a motorcycle without full alertness and awareness. When in doubt, find another means of transportation. Motorcyclists are aware that sometimes the only thing between them and the road is a pair of handlebars. It is important to execute as much precaution as possible to avoid injury or death. Packing up for a day of riding with your comrades sounds like the perfect summer activity if you ask us. But setting up expectations before you leave is paramount to the safety of you and your group. How often will you take breaks? Where will you stop? What route will you take? Who will lead? How fast will you ride? These are all important questions to discuss with your group before you even warm up your engines. Less experienced riders may need to take frequent breaks, and riders with sidecars may request to go slower. Make sure to talk with your group and figure out a plan, and ride within the ability and comfort level of the least experienced member. Communication in group riding is also key for a safe trip. Establish hand signals prior to departure, and practice them early and often to make sure everyone is on the same page. You might consider having signals for riding single or double file, speeding up or slowing down, stopping, or pulling over completely. Motorcycles can be an efficient and convenient way of commuting, especially when it comes to heavy traffic congestion. Lane splitting, or passing between slow-moving vehicles by riding over the dashed lines, is a common practice performed by motorcyclists. Lane splitting laws differ from state to state. Here in Texas, there are no formal laws for or against lane splitting, but bills on both sides of the argument have been filed in recent years, so be sure to keep up on the latest developments before hitting the road. Advocates for lane splitting have claimed that lane splitting helps motorcyclists to avoid fatal rear-end accidents, and can help improve rider safety. If you do choose to lane split, you can take the following precautions to do so as safely as possible and avoid the risk of injury. Do not lane split if traffic is moving faster than 30mph – and some experts even recommend not doing so in traffic moving faster than 20mph. Lane splitting in fast moving traffic can catch other motorists off guard and can lead to an avoidable collision. Make sure other motorists see you. Taking precautions like wearing a brightly colored vest or riding with your headlamp on during the day can make you more visible to cars on the road. And don’t forget to use your blinker or hand signals! Be aware of all vehicles in your vicinity, not just the ones you are trying to pass. Let’s say traffic is moving slowly, and you want to pass between the two cars in front of you. Just as you begin to execute your move, another car switches lanes and enters into the spot you were trying to get to. This car had no idea you were even coming. By remaining vigilant of all cars in front of, behind, and next to you, you will be able to safely merge back into traffic while avoiding collision. 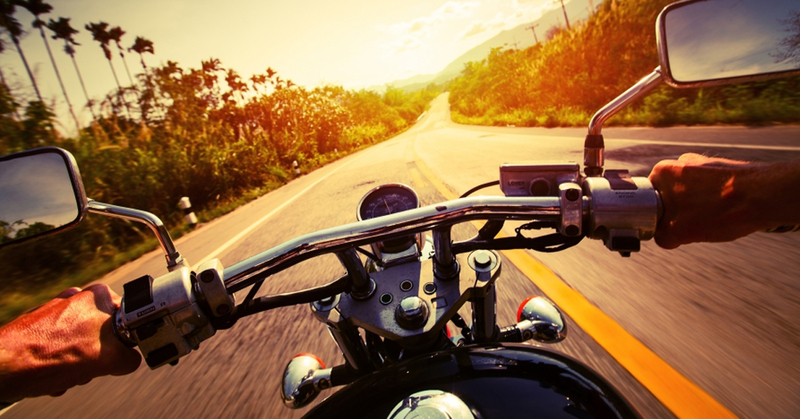 Motorcycle laws vary from state to state, and it’s important to be aware of these laws. If you suffer a personal injury as the result of a motorcycle accident, your case will be stronger if you can prove you were following laws and taking all precautions necessary to protect yourself. This includes wearing a helmet. Texas law requires that all motorcycle operators and passengers under the age of 21 wear a helmet. Motorcycle operators over the age of 21 are exempt from this law if they have completed a Department-Approved Motorcycle Operator Training Course, or have adequate health insurance coverage. However, considering that a helmet might be the only thing between your brain and the hot pavement, we would suggest erring on the side of caution and wearing one regardless of your age or experience level. We, here at The Law Offices of Alex R. Hernandez Jr., PLLC. want motorcyclists to have a safe and enjoyable summer. But we also understand that not all drivers are going to be as vigilant as you are. If you have been injured in a motorcycle accident in the state of Texas, contact our Victoria or Corpus Christi locations for legal advice and representation TODAY. We want to help you get the compensation you deserve so that you can be back riding as soon as possible.